Matters of morality and personal integrity can be mentally draining, especially over almost three hours, but Bawds' production of A MAN FOR ALL SEASONS retains that extra spark to make even the most impatient sit through it. Thomas More is in a predicament. As the brilliant statesman, lawyer and humourist who defines himself by the laws of God and the land, he cannot condone the divorce of Henry VIII. Throughout the land, he has a reputation for being just and honest and soon all eyes (especially the King's) turn to him, questioning his loyalties. He believes that he "is not the stuff from which martyrs are made", and through his silence he will be left alone. However, he underestimates Thomas Cromwell's ruthlessness. His silence is misconstrued as those around him draw their own conclusions about his position. The cast gave extremely strong performances. 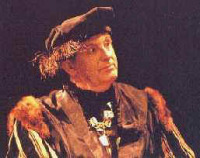 Guy Holmes was particularly good as the unpredictable King Henry VIII in the tense scene in which Thomas More refuses to consent to his divorce from Catherine of Aragon. 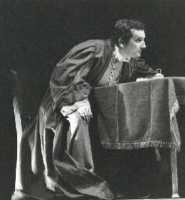 The narrator, or "common man" (Ron Meadows) crops up in most scenes, adding a touch of humour and some simplicity to an otherwise complex drama. Not only does he sum up the proceedings in "plain and simple" English, but he is also literally a common working man. Through effective costume changes he plays out several roles extremely well, including More's servant, the boatman, the innkeeper, the jailer, and finally, the executioner. Another strong performance is given by Rosemary Eason as Alice, Thomas's long-enduring wife. Always very particular but with a fiery temper, she supports Sir Thomas to the bitter end. She certainly has more spirit about her than his rather drippy daughter Meg, whose willingness to submit to her father's will is best described by her mother likening her to a crab that would scurry about the seabed if he so asked. Cromwell, played by Martin Woodruff, makes a thoroughly callous villain unscrupulous in his desire to see More take an oath of allegiance acknowledging the King's supremacy over the church. His immorality is in stark contrast to More's virtuous beliefs and makes for some excellent courtroom drama in the final scene. This production has a fabulous cast with colourful 16th century costume. Director Colin Lawrence has perfectly captured this unsettled period of Henry VIII's rule. 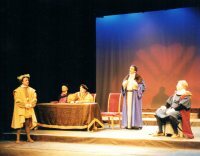 A Man For All Seasons, Robert Bolt's finest play shows us how this scholar, ambassador, Lord Chancellor and friend of the king sacrificed the good life and the family he loved for a matter of conscience. 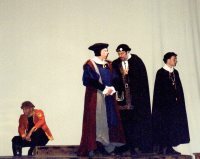 This story of the rise, and fall, of Sir Thomas More is rich in historical characters. 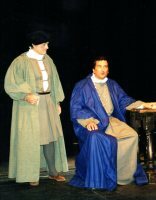 His dealings with the great figures of the time - Cardinal Wolsey (Derek Brown), Thomas Cromwell (Martin Woodruff), the Duke of Norfolk (Hugh Mellor) and Henry VIII himself - are seen through the eyes of the common man the poor cynic for whom a conscience would be a great inconvenience. A visually stunning opening augured well: Peter NonA/ood's austere and deceptively simple settings proving effective, as we moved from the More's home, to the river, to the Cardinals office, the Court and back again. relationship between the three More's was tangible. Guy Holmes was the definitive Henry VIII. much for the commitment to this production that the majority of those prepared to be part of it for the sake of one scene were in the main all quite capable of playing lead roles. imprisonment during which he had used all of his extraordinary intelligence and lawyer's wiles to avoid execution. This impressive performance swept through my emotions, as I am sure it did many others and is one that will linger in the memory for a long time. I joined the exasperation of his wife and his friend Norfolk when he would not waiver from his beliefs but I am afraid, not the quiet acceptance of his daughter. One wonders whether Thomas Cromwell ever regretted his persecution of More - probably not as he appeared to be a man without conscience. Although overly long, the production was a great credit to all involved and in particular to Director Colin Lawrence.